I recently came across one of the age-old (okay, perhaps not that old) documentaries that truly sparked my interest in synaesthesia (as it’s often spelled) and led (consequently) to the founding of Synesthesia Test. The video, called “Daniel Tammet – The Boy With The Incredible Brain”, showcases (appropriately enough) the incredible brain of one Daniel Tammet – a “high functioning autistic savant” from East London, England. To sort of set a benchmark as to his mind’s capabilities for the curious among you, Daniel once successfully recited the constant Pi (a circles circumference divided by its diameter) to 22,514 digits – a feat that took over five hours and ended on his own accord (not by mistake). He is also able to do seemingly impossible calculations in his head with incredible speed, as well as learn to speak and write new languages in around a week. If you watch the video series, which I’ve posted the first video to below, you’ll get to see the rest. How does this relate to synesthesia, though? Good question. Interestingly enough, it has been proposed that synesthesia and savant syndrome are strongly linked. Daniel’s case is perhaps the quintessential example of this proposition. When Daniel envisions a number, for example, he sees a rather specific shape with a specific color, which usually invokes a specific feeling or emotion. If you watch the documentary, you’ll see that, when Daniel is undergoing various tests, he exhibits this as something that’s a real, natural function of his brain – rather than something that he “tries” to do. One word that he uses quite frequently is “landscape”. When Tammet recites a number with numerable digits (Pi, for example), he sees a landscape that consists of the shapes that are representative of each integer. By making his way through the landscape in his mind, he is able to see (and recite) each digit in eerily perfect sequential order. Something else that’s relatively amazing – Daniel’s shape/color/emotion association doesn’t stop at digits (0-9); each integer from 0-10,000 has its own respective “symbol”. Pretty terrific, huh? While these tendencies aren’t necessarily indicative of any one type of synesthesia, we can certainly see some of the characteristics of a few of the common manifestations that we’ve discussed. 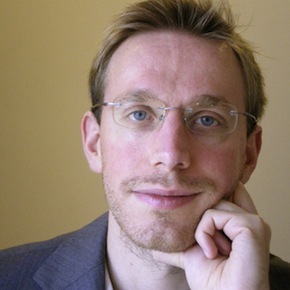 If you’re interested in learning more about Daniel Tammet and the experiences of those who have both synesthesia and savant syndrome, the video above is a great place to start. Furthermore, you can check out Tammet’s offical website – Optimnem, or either of his two books – Born on a Blue Day & Embracing the Wide Sky: A Tour Across the Horizons of the Mind. I’ve heard both of the books are fantastic. That’s all for today, though! 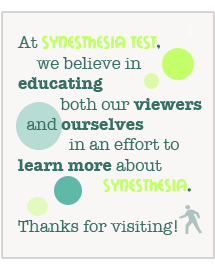 Stay tuned in the coming days for a post on some of the still-active online synesthesia tests! I look forward to seeing you, then! What kind of synesthesia dose Daniel have? Daniel seems to have experiences that are indicative of a few different types of synesthesia, rather than just one singular type. Sorry to disappoint, but the existence of EIDETIC MEMORY, or a “photographic memory” is HIGHLY contested, and nearly all studies conclude that it DOES NOT exist. (There are many memory “tricks” involved, but ≠ eidetic memory.) It’s fascinating to research! !